Hard earmarks are for specifically dedicated accounts – we know when the expense is coming, we know what the amount will be, and it is more of a ‘need’ than a ‘want.’ We would only shift the money in the case of an emergency that is big enough to disrupt the plans we had for it. An example of a hard earmark in our money management is our Cars account. We have a regular schedule of insurance, registration, and fee payments that come up one to two times per year, plus we have a good idea of the amount we need on hand for future repairs. The only way we would repurpose this money is if an emergency comes up that disrupts our plans for Kyle moving away from Durham and we don’t need to get the second car running. 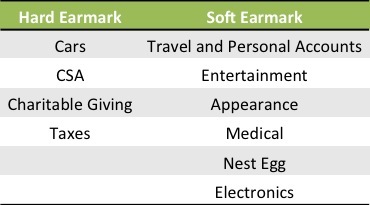 Soft earmarks are for purchases that are well-defined wants or purchases that we can only vaguely anticipate. Because this money is largely discretionary, we can repurpose it as our priorities change. As for the “needs” that are not well defined, we have to base our savings on past spending or reasonable estimates, and if we over-or under-save we will have to shift some funds. The purple boxes in the diagram above are the easy purchases to categorize and the teal boxes are ones that are more difficult to categorize as hard or soft. Of course it is only useful to earmark to the extent that it helps you reach your goals. If your goals change, it makes sense that your earmarks would change – but don’t be capricious! For us, the earmarking is helpful to encourage savings – we are more motivated to save when we have a clear picture of how the money will be spent, especially for “fun” savings like Travel. It may be useful for us to have just 3 accounts – hard earmarks, soft earmarks, and our emergency fund. We don’t need to break the hard earmarks into multiple accounts like we have them now if we keep track of the purposes and expenditures well. A system like this could help us clarify accounts like “Cars” that contain mostly hard earmarks but also some soft ones like anticipated repairs. Do you have targeted savings? How set-in-stone are your allocations? Have you repurposed savings in the past? 38 Responses to "Hard and Soft Earmarks in Targeted Savings"
I’m always impressed by the level of detail you put into your budget categories. I just have “savings” (for big things in the future) and “discretionary” (for all that stuff I need/want at some point soon, like your appearance, travel, entertainment accounts). And I don’t “save” for upcoming big bills / discretionary spending, I just let the money build up and sit in my account (i.e. spend less each fortnight than I’ve budgeted in those categories, keep track of how much “extra” I have for each category, and then use it up when the car needs a service, or all my clothes wear out at once). 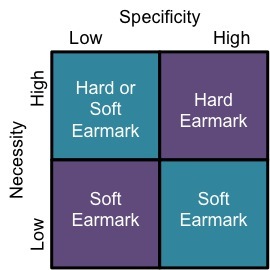 I like the categorisation of hard and soft earmarks. While you are “impressed” other people may be “turned off” or “thinking you’re overdoing it!” I don’t think I would trust us not to spend money we let pile up in our checking account for a future expense, which is why I zero out our checking account every month. We have a general savings account – our “nest egg” – which we pulled from when our Electronics savings account couldn’t cover our smartphone purchases, for instance. But for everything we can anticipate or think that we are likely to spend, we try to save separately. It really helps us save up for our big travel and entertainment purchases and lets us know whether we can afford something without a lot of additional analysis. I have 3 savings accounts, one hard earkmarked, dedicated for a downpayment for a house, one emergency savings account which I guess is pretty hard earmarked, and then a soft earmarked, which is for vacations, holidays and special occasions. This way of managing my savings is a good way for me. Makes me have control over my savings! That is the model we will likely move to next year. We had to move through this targeted savings model to help clarify our thinking on saving for irregular expenses, I think. When we start saving for a house downpayment and new-to-us car those will likely be soft earmarks at first and become hard when our specific needs crystallize. Interesting – we have both hard and soft earmarks (to borrow your term) for our accounts. I guess the “hard” ones are any ones that we have ASPs on or are regularly scheduled (property tax, etc). Tushar @ Everything Finance recently posted..Is Pet Insurance Worth It? We do something very similar as it helps us reach our savings goals and makes it easier to have a specific category. Being self-employed it can be a little more difficult to manage, but we’re generally able to meet all of our hard targets and most of the soft ones. JohnS @ Frugal Rules recently posted..What’s Your Definition of Insanity? I think being self-employed means you need a much larger buffer, either in your business account or personal. It is difficult to get a large “employment-related” buffer when you have a bunch of little savings goals that you don’t want to repurpose. We don’t have any irregular expenses that can’t just come out of the monthly cash flow. We have one savings account with everything (10 month Efund and other savings) that is tracked by spreadsheet. Our monthly surplus gets allocated by percentage in to 1) Student Loan (in deferment) 2) House Down Payment 3) Car Replacement 4) Travel and 5) Extra. Regular irregular expenses (car insurance, parking pass, etc) usually just come out of that month’s cash flow but irregular expenses (medical, new dryer from Craigslist, my part of throwing a friend’s bridal shower, Christmas gifts, etc) have been funded, all or in part, by our “Extra” savings. In an emergency we would first turn to our Efund and then to the other accounts if that wasn’t enough. The Student Loan and Down Payment funds are especially flexible since we’re not sure where we’ll be after I graduate and whether we’ll want to buy a house there right away. And the percentage based allocations are flexible, too. For example, if we needed to replace a car sooner than anticipated I could see us reducing the savings in the other categories to save up money faster for the car replacement. Thanks for your comment! I always like to hear about people’s goals and savings systems. It sounds like your accounts are fairly “soft” as this stage, which makes sense given your life situation. You seem really motivated to save into all these different accounts, especially Extra, but I think we have needed to put a name on the money as early as possible to motivate us! How did/do you decide the percentage of your extra money to put into each of the various savings accounts? It’s great that you’re saving already for a house and paying off loans even though you don’t have specific plans for when you’ll use that money yet. It’s going to feel so great to be far along on those goals by the time you make them very specific! We always adhere pretty closely to our budget that is pretty minimal, so the savings part doesn’t really take specific motivation. We are currently dividing our surplus 24% Student Loan, 23% House, 23% Car, 20% Travel (too much, probably, but travel is a priority for us), and 10% Extra. I recently calculated that at our current rate of savings we’ll be able to pay my student loans off almost in full by my target graduation date! However, we’re open to the possibility that we’ll use some of the money on a down payment instead of lump sum student pay off, or vice versa. Similarly, we’d be willing to move funds around if a car dies and we couldn’t quite cover it out of the account. We don’t have very hard savings targets right now – mostly because with me in school, we are not making very much at all. The non-negotiable goals we do have are retirement goals – we’ve committed to maxing out both my husband and my Roth IRAs this year, and then husband is saving another 10% of his salary in his 401K, and his employer provides another 10% match. We make sure we hit these retirement goals above all else. Our retirement savings are the hardest of our hard earmarks. 🙂 I put them out of my mind since they aren’t anywhere near cash in terms of accessibility. We have 2 savings accounts. One is for housing expenses. It is the account we saved the downpayment for the trailer. Afterward, it was the account we put money to go towards future repairs. Now that we’ve sold again, it is the account we will save for a down payment on a real house in the future. The amount that goes into it from month to month varies, because it isn’t a huge priority at the moment and the “left over at the end of the month” money goes in there. The other savings account is where my excess income goes and that is for all of our non-budgeted expenses. When I first graduated from college and got my job, I had three savings accounts: general, car, and house. I got the general one up to a certain amount and then left it alone. The car one I got up to $4,000 and then left it alone and poured my money into the house one. But then I realized I couldn’t get a loan for a car, so I took the money out of the house account and repurposed it to “car”. Finally, when I was buying my condo, I had a future car account again, but I repurposed that money to “condo” and I doubt I’ll save up for another car again anytime soon. Now, I have a few savings accounts: buffer in my checking ($5k), general savings, condo decorating fund, insurance deductibles, and future IRA. I’m thinking I should just move the insurance deductibles into general savings. I also recently moved my checking buffer into Series I Savings Bonds, which will go through by the end of the month. The condo decorating fund will eventually be depleted (probably close to this summer) – it’s sort of like a sinking fund and was established with some inheritances. I use the future IRA account to collect money and make the IRA contributions all at once since it’s easier to make the entire year’s contribution at once when I can’t do direct Roth IRA contributions anymore. Most of my savings goes to the mortgage or investments now that I have a large enough cash buffer to feel comfortable. I accumulate things like property taxes and annual sports dues in my checking account as part of my budget. Some line items are yearly and accumulate all year. I found that that was easier for me to track than transfers out of targeted savings accounts since my mental idea of what I can spend is quite separated from how much money is in my checking account. Thanks for sharing how your system has evolved! I like hearing about all the logistics. I think if we were stricter about our budget (or had a budget that we never exceeded) we could keep some money for anticipated purchases in checking, but for now I prefer out-of-sight-out-of-mind for our checking account. It sounds like you were only soft earmarking the car and house funds – I think it would be difficult to save up for both truly simultaneously as they are such large purposes so we might end up doing what you did and devoting savings for “both” to whichever is needed first. Yup, quite large purchases – my car cost about $20,000 and I put a little bit over $70,000 down on the condo! The hard part about the condo fund was that I didn’t really know exactly how much it needed to be since I had a pretty wide price range (about $100,000) and I had no real idea how much closing and moving costs would be either… That drove me crazy, as I’m sure you can imagine! I think that if I had to spend any longer saving up for the condo, it would have been easier to dip into it. As it was, I bought the car a little under a year after I started working and I spent about a year and a half after that saving up for the condo. If it had been 5 years to save for the condo, that would have been much harder. I think if my condo fund got up to about $120,000 without finding something to buy yet, I would have started investing instead of putting aside more cash. I still liked having a label on the money even if it was so annoyingly soft-marked as you would call it. It made me feel like it was more purposeful. I’ve learned though that with my personality, it’s easier to rearrange small amounts of funds in a checking account spreadsheet than in multiple savings accounts – seeing all the transfers makes me realize just how OCD I am about where the money is and I worry about exceeding the six transfers per month limit, lol. I love how hands-on you are with your finances. I’ve had to change up my saving allocations in the past. It’s a part of life and the sooner that you recognize this and take the time to stay on top of your finances, the greater the changes of success you will have. Great post! I like how hands-on we are, too, but others might see that as high maintenance! What events came up that you wanted to change your savings earmarks? This is an important concept. So many people just throw money into an account without allocating it. We have a few different bank accounts set up for different things. By doing this it becomes easier to know what money is to be used for what. That way you don’t use money designated for tax bills to help fund that vacation getaway. That would be a grave mistake!! It’s so nice to not have to re-analyze our whole monetary position every time we make a “want” purchase. We went from having very little money (in graduate school) and spending very little so I could keep everything in my head and every spending decision could be scrutinized based on what we had in checking or savings, to having way more money than we spent (after getting real jobs) and lots of expenditures, so we didn’t have to keep track then either. Right now we’re futzing with other systems since DH leaving his job in May means we’re closer to spending what we earn and will have to be more mindful. That’s a drastic transition! Are you trying out other budgeting/saving systems or just thinking through how they would work for you? How could soft earmarks be controlled?